AboutAcura: No Rear-Wheel Drive for Acura? 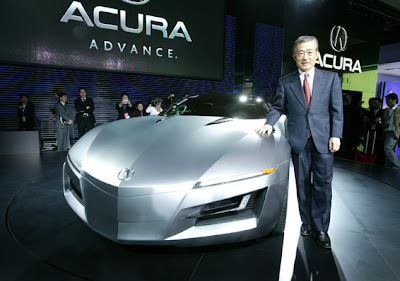 Honda's CEO, Takeo Fukui, states next Acura NSX will have a V10 engine with rear-biased SH-AWD. He also commented on how they're trying to keep the weight of the car down to "be faithful to the original NSX's 'everyday supercar' formula." Mr. Fukui did not give any details on the time line of the next NSX. When asked if Acura was working on any FR (front engine with rear-wheel drive), Honda's CEO "referred to the FR SH-AWD NSX successor and suggested that Honda could take what they learned from that development program and apply it to other vehicles." A little disappointing because this kills the rumors that the next NSX is a mid-engine V8 with "true" rear-wheel drive supercar. It also seems like Acura is not getting a "true" rear-wheel drive platform for a long time (if ever), and the closest we're going to get is a rear-biased SH-AWD.